Cookbook #38: Mexican Cook Book. By the Editors of Sunset Books and Sunset Magazine, Lane Books, Menlo Park, California, 1972. 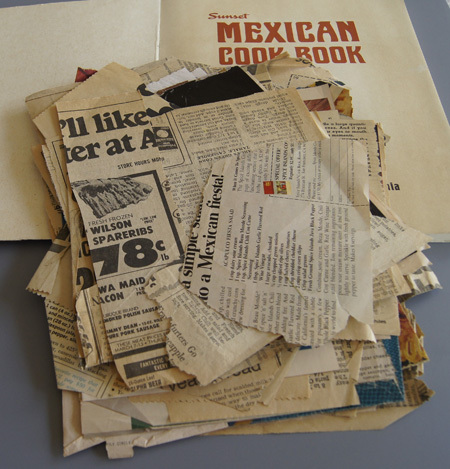 All of the clippings are for Mexican-style dishes, and all are dated in the early 1970s. Mother’s writing is on some of them. Apparently she used this book as her “Mexican cooking file”. I sigh. Burdens of memory. I should toss the lot but I know I’ll go through them one by one, thinking of her planning dinners. At first glance I thought I’d just recycle this cookbook. It isn’t old enough or personally marked up enough to warrant historical value. 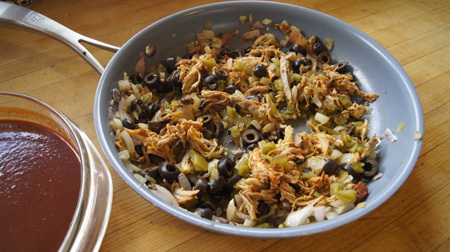 But actually, I find that it is a good reference for basic, from-scratch Mexican cooking. This cookbook is more usable than my other 250 Cookbooks entry, Elena’s Secrets of Mexican Cooking, at least in my opinion. 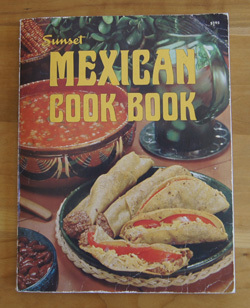 This Sunset Mexican Cookbook book gives straightforward directions for preparing all types of Mexican food. In the tortilla chapter, for instance, advice on buying prepared tortillas is given along with recipes for homemade tortillas. Recipes are given for basic sauces and fillings, tortilla dishes, enchiladas, tamales, appetizers, soups, salads, vegetables, rice, and desserts. The recipes don’t call for odd ingredients. My only complaint is that many of the recipes call for frying foods in oil, thus adding calories. 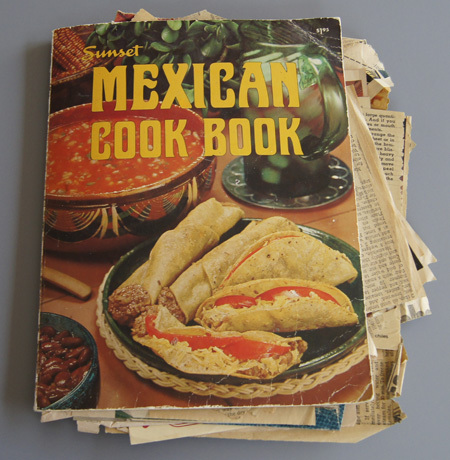 Like Elena’s, this cookbook discusses the history of Mexican-style cooking. I learned that the Aztecs were highly advanced in horticulture and grew tomatoes, avocados, sweet and white potatoes, peanuts, squash, pineapple, papayas, vanilla, and varieties of beans not known in Europe. And chocolate too. The Spaniard ships that returned to Europe were laden with seeds and cuttings, which flourished in various climates. 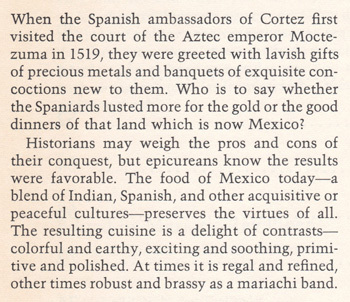 And the Spaniards introduced many new foods to Mexico, such as beef and chickens, wheat, rice, nuts and spices, peaches and apricots. Now, what to cook? OMG, here is a recipe for Red Chile Sauce! To be used on enchiladas! Why does this interest me? For years, I’ve bought canned enchilada sauce. The price keeps going up, so that a small can now costs over 2 dollars. What the heck? Couldn’t I make my own? But I’ve tried, starting with tomato sauce and adding spices. Never could get that same “enchilada sauce” taste. My tries just tasted like tomato sauce, reminiscent of spaghetti sauce. So I had spaghetti-sauced rolled tortillas. Not very good. So I started buying different brands of enchilada sauce and carefully noting the ingredients on each type. 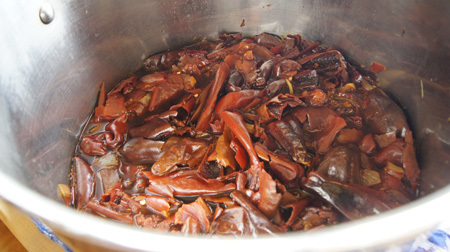 Most of them contain “dried red chiles” as the main ingredient (after water, that is). 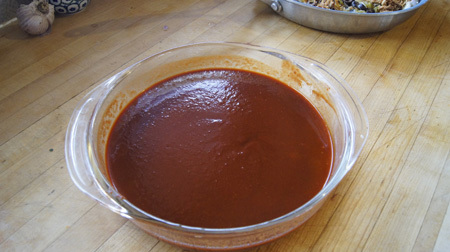 A couple of years ago I pulled a few enchilada sauce recipes from the Web and planned to try them. But I never did. So now is the time! 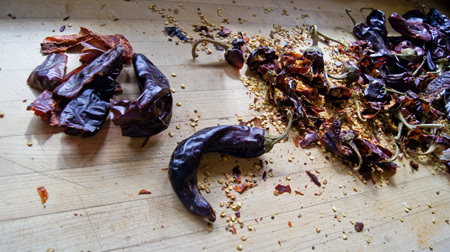 The Red Chile Sauce in this cookbook starts with dried red chiles. First they are soaked, then blended and cooked with a few spices and a small amount of tomato paste. I had nabbed an online recipe that is similar, so I sort of combined the two into a plan of attack. 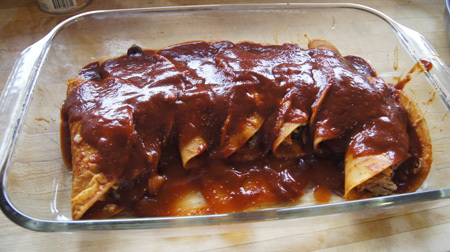 I’ll use the sauce to make Folded Pork Enchiladas. 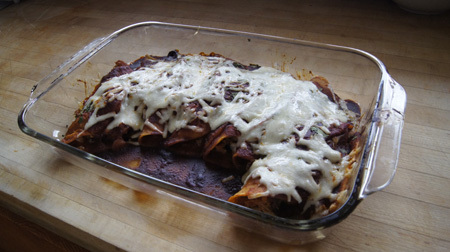 Now, I have a method for making enchiladas that I like, and I’ll share that too. 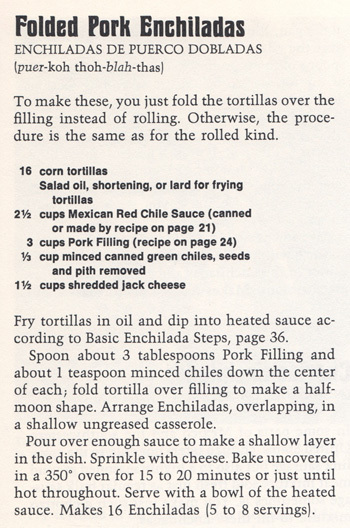 But I’ll do the Folded Pork Enchiladas like the recipe in this book, just to compare and contrast methods. The Red Chile Sauce isn’t going to be a recipe for someone who doesn’t like fooling around in the kitchen. This is a recipe for a chemist at heart. For me, this is going to be fun. And messy. And potentially a failure. The pork filling is cooked pork (I have some pulled pork in the freezer), cooked onions, green chiles, and olives, mixed with a little red chile sauce. Note that the tortillas are fried and then dipped in hot sauce. I usually don’t fry tortillas for enchiladas, but will for this recipe. So what this involves is taking a whole bag of dried chiles, blending and cooking them until they make a sauce. 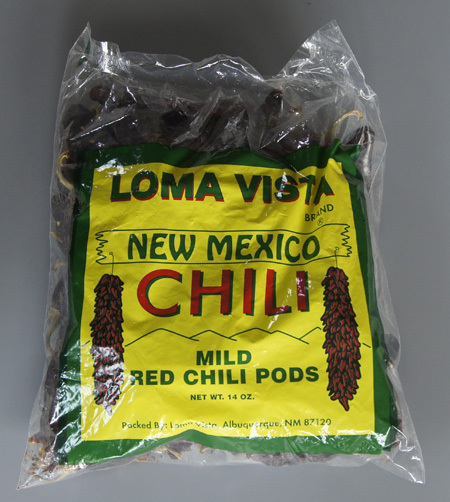 I’ve always wondered why they sold bags of dried chiles in the Mexican foods aisles! I don’t advise toasting the chiles, as I did and my sauce was slightly bitter. It wasn’t very hard to remove the stems and seeds, and there really wasn’t enough pith to worry about. I just chopped off the stems and shook out the seeds. I consulted another recipe, and decided to cook the chiles first, then process them in the food processor. It also suggested adding flour. I decided to use beef broth in the cooking liquid, as well as a few tomatoes and more spices. I put the cooked chiles in the food processor in batches. Then, I pushed the processed mass through a colander. I put the processed-strained chiles back into a pot on the stove, tasted it, and added more spices and ingredients to get the taste more like the canned store-bought enchilada sauce that I like. These were very good. I probably won’t make them this way again, though, mainly because of the frying step (calories). I usually steam the tortillas until pliable, fill with meat/cheese/olives/cooked onions, place not-touching in a glass baking dish, cover withe sauce, and then cover lightly with foil and bake at 375 for 15-20 minutes. I will make the red chile sauce again, though. Plus I have lots frozen to use in the coming weeks. This was a successful project! Cut the stems off the dried chiles and remove the seeds. In a large pot, toast the cumin seed until you smell the aroma, then add the chiles and the rest of the ingredients. Bring to a boil and then simmer 30-60 minutes. Let cool a little. 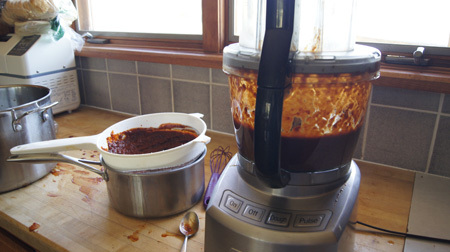 Place the chiles and the liquid in your food processor in batches – it probably won’t all fit in at once. Process until very smooth, a couple minutes at least. Press the processed chile mixture through a colander. This removes any big pieces of chile skins. Simmer about 15 minutes to blend the flavors. 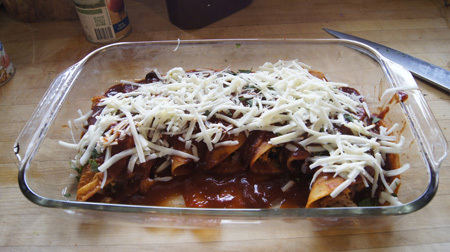 To make enchiladas, I used a couple cups of the above sauce and added just about a half cup of canned tomato sauce. The flavor was a tiny bit bitter (I think because I toasted the peppers) and I thought the tomato sauce mellowed it to perfection. This entry was posted in 250 Cookbooks, Main Dishes by admin. Bookmark the permalink.